The Rosidal Soft Wound Padding is washable, non-slip padding helps provide even pressure distribution of compression bandages over the extremities. 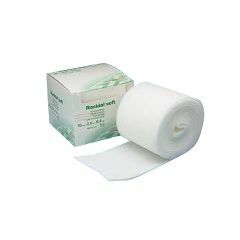 As a result, Rosidal Soft is ideally-suited for padding under lymphedema and venous edema compression bandage applications. This latex-free, skin-friendly padding is made from polyurethane foam which is highly breathable and permeable to moisture. The interlocking open pores provide slip-resistant assurance and can help prevent the compression bandages from sliding. Durable and tear resistant, Rosidal Soft can withstand repeated washings and not lose its elasticity.